Visiting Professor Kevin Doolan, Partner in the international law firm, Eversheds, will be teaching a short course “Corporate Skills for New Lawyers,” starting April 7. 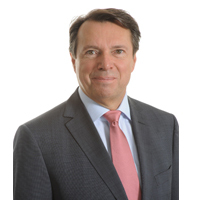 Professor Doolan has been a partner at Eversheds for more than 25 years and since 2001 has been a full time member of the firm’s management team based in London. In 1996 he completed his MBA at Henley Management College and, in his role as Head of Client Relations, is responsible for leading all business development activity for Eversheds Offices in 27 countries across Europe, the Middle East and Asia. 1. Why did you choose to teach at UM Law? 2.What are you most looking forward about teaching at UM Law? 3. What can a UM Law student hope to get out of your class? 4. What is your most memorable teaching experience? 5. Where is the coolest place you have gotten to travel, either as a result of teaching or personal travel? 6. Please give us one fun fact about yourself.